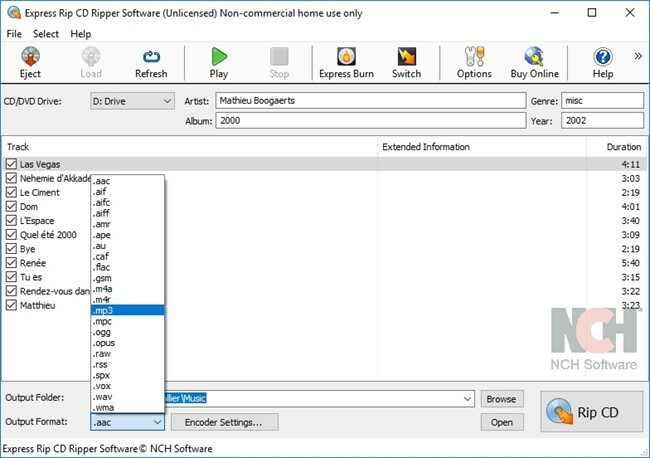 Express Rip is a software program for Windows that lets you extract digital audio tracks directly from audio CDs to either Wave (wav) or MPEG Layer-3 (mp3) files on your hard drive. By using direct digital extraction pure audio quality is maintained and the process is very fast. Express Rip Power Edition Features: * Converts music to wav or mp3 files. * Quality CD digital audio extraction (ripping). * Extract audio from CDs to wav, mp3 wma, m4a, aac, aiff and more. * Complete control over mp3 encoding including constant and variable modes at selectable bitrates. * Correct volume of ripped tracks as they are extracted. * Automatically updates the displayed track-list when a CD is ejected or inserted. * Automatically link to an online database to obtain track and album information. * Can be run from command line with other applications. * Simple, easy to use interface.